"These burgers include the Asian flavors of hoisin, Sriracha sauce, and sesame oil with a little crushed red pepper for some added heat." Mix ground beef, green onion, hoisin sauce, Sriracha sauce, sesame oil, garlic powder, red pepper flakes, ginger, salt, and black pepper together in a bowl until thoroughly combined. Divide meat mixture into quarters; form each portion into a patty. Grill on the preheated grill until meat is browned and no longer pink inside, about 10 minutes per side. 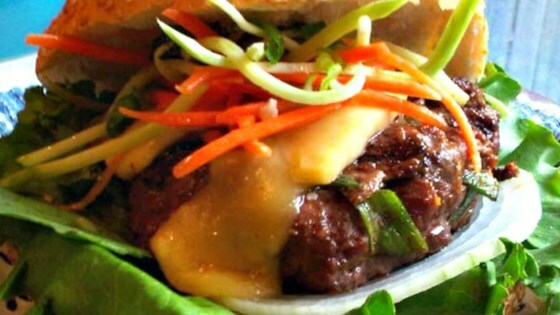 Awesome Asian flavors in a burger! The flavor was excellent, but this needed a binding ingredient; my patties fell apart on the grill. Very frustrating. Made this recipe last night and hubby and myself absolutely loved it. Flavors are absolutely on point. The only thing hubby kept asking was when are you going to make this again? So interesting! (I was out of Hoisin sauce so I added a little soy sauce and peanut butter (I looked it up, it's a good sub!) and added a smidge more of the garlic, ginger and sesame oil).